Have you always wanted to be able discern the different types of gay women out there? Of course you have! 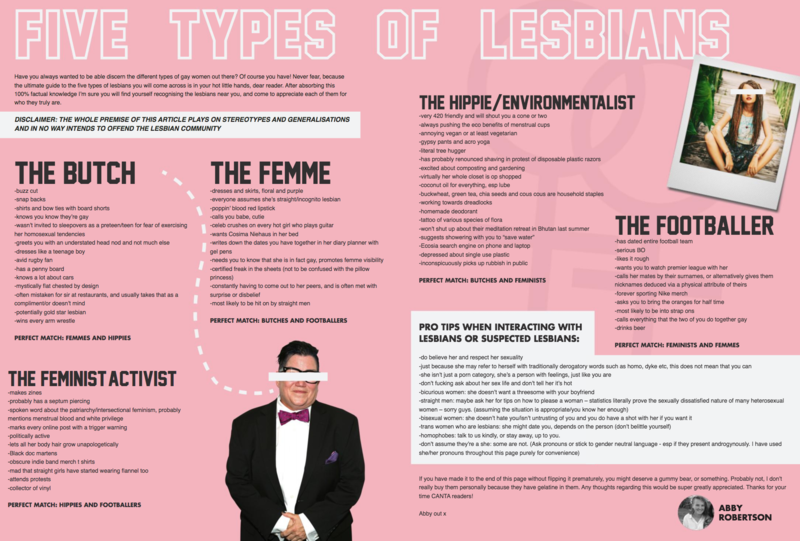 Never fear, because the ultimate guide to the five types of lesbians you will come across is in your hot little hands, dear reader. After absorbing this 100% factual knowledge I’m sure you will find yourself recognising the lesbians near you, and come to appreciate each of them for who they truly are. -homophobes: talk to us kindly, or stay away, up to you. If you have made it to the end of this page without flipping it prematurely, you might deserve a gummy bear, or something. Probably not, I don’t really buy them personally because they have gelatine in them. Any thoughts regarding this would be super greatly appreciated. Thanks for your time CANTA readers!